Dr. Jack is the owner of Southeast Sports & Rehabilitation and a native of Homer City, Pennsylvania where he grew up as a two-sport athlete excelling in baseball and football. After an number of injuries including concussions suffered on the football field, he focused his attention on baseball. In 2003 after graduating high school, he went on to attended Clarion University where he was recruited to play baseball. After one year at Clarion he suffered a rotator cuff injury at the end of the fall season, which brought him to where he is today in Sports Chiropractic. Aside from Dr. Jack’s work at Southeast Sports & Rehabilitation, he is an continuing education instructor for FAKTR and Dynamic Tape, teaching courses to chiropractors, physical therapists, athletic trainers, massage therapists and other healthcare providers all over the United States for Southeast Sports Seminars. Dr. Jack is also an adjunct professor at Greenville Technical College where he teaches Anatomy & Physiology. Dr. Jack, in the Spring of 2017 accepted an Adjunct professor position at Wofford College, teaching Comparative & Human Anatomy. What sets you apart and what are you known for? If I had to pick one thing that I’m known for it would be movement. I enjoy looking at the body as a whole and then breaking it down into its individual parts. My job is to make sure that I address each issue which effects the quality of movement and pain associated with that movement. In certain cases this may be manipulation of a joint, instrument assisted soft tissue manipulation (FAKTR), stretches, rehabilitative and corrective exercise. Dr. Jack is the only chiropractor in Spartanburg, certified in the Selective Functional Movement Assessment (SFMA), which is widely used in the evaluation of musculoskeletal and joint injuries. The assessment allows us to look at the parts and determine whether they are painful or dysfunctional, and gives us an idea of which areas to begin working on and improving movement patterns. Dr. Jack is also the only chiropractor in the upstate that is certified in the Functional Movement Screen (FMS). Which is used for patients that have no pain but may have difficulty with squats, deadlift, recurring overuse injuries or history of a previous injury or surgery that doesn’t have any pain associated with it. This screen uses 7 movements that will identify either mobility or stability problems with that movement. 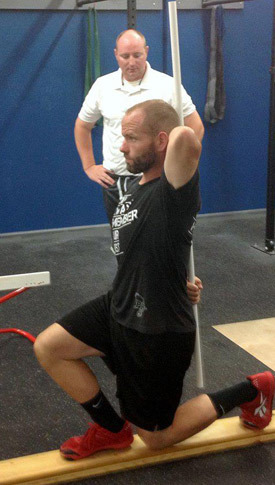 From this assessment we are able to provide corrective exercises based on those movements. of who patients may require referral for imaging studies, interventional procedures, medications and surgery. What is your personal passion outside of work? My other passion is teaching. Sometimes I think we forget that Doctors are TEACHERS first. I love teaching other clinicians whether they are chiropractors, physical therapist, athletic trainers, occupational therapist or massage therapist about FAKTR and Dynamic Tape. I love teaching my students and patients about their bodies when it comes to Anatomy & Physiology. I enjoy teaching these courses because it keeps me up to date on the most current research as well as being able to interact with other healthcare professionals, whether they currently are or studying to become. When I’m not working you will find me in the yard. When I was in undergraduate school I worked part-time at three jobs, one of which was at a golf course. I worked at this golf course for 4 years and was probably the most fun I’ve ever had at work. When I first started working there, I would have days where I would carry a weed whacker around for 8 hours. Sunday afternoons if I’m not working outside or grilling out, you will find me and my wife Miranda, playing with our two English Bulldogs and our son Cameron. I grew up 45 northeast of Pittsburgh, PA and it’s a great small town with only 1200 people. The reason I’m here is because I love being close to the beach and not having to deal with SNOW! I spent 24 years in Pennsylvania and when I left I found out that I am not a cold weather person. I enjoy visiting Pennsylvania and I miss the sporting events (Steelers, Penguins and Pirate games) but I don’t miss the snow. It would be impossible for me to give up cooking. I am a Food Network junkie most nights of the week and have always loved to cook. Cooking was something that I learned to love from my parents. I was always in the kitchen with them when I was younger and was always trying to help out as best I could. I have no formal training but I love making my parents recipes, that I remember loving as a kid.